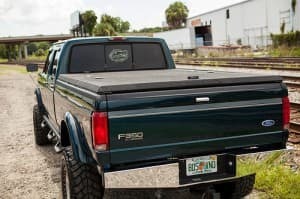 When looking to buy a tonneau cover for your pickup truck, it is beneficial to know more about the different brands and types. You will then have the information that you need in order to make a decision on which tonneau cover is the best one for you. The Bak Flip Tonneau Cover has some features that are quite unique, such as the ability to give you access to the entire truck bed if necessary. This cover will fold up against the cab of the truck being out of the way of the truck bed giving you all the room you will need. You can easily haul or transport all of the things you need, such as a 5th Wheeler, without needing to remove the cover first. This cover also gives you better visibility in the rear because it lays flush with the bedside rather than the top of the truck bed. The fabric of this cover is made using materials that are strong and durable. It is tear-resistant and heavy duty ensuring it will last for years to come. Water will not pool up on this cover because the ribs are made using aluminum. The black rails and bows are stylish but are also what seals the cover up tight using the heavy duty Velcro sealing system. This system helps to keep the bed of the truck sealed, but is still easy to open and close. This cover also has an automatic tension control feature in the latch, that is unique, making it easier to close. This cover can be quickly installed. Within just a couple of minutes, you can have the side rails clamped on and the spring-loaded header guide all put into place. Even though the cover was designed to install quickly, the quality of it was not compromised. It features Velcro brand fastening which will keep the cover securely in place, as well as automatic tension control. You will also receive a lifetime warranty for this cover giving you the peace of mind that you will have a cover that will stand the test of time. Knowing more about various tonneau covers on the market gives you the information you need to decide which one is best for you.